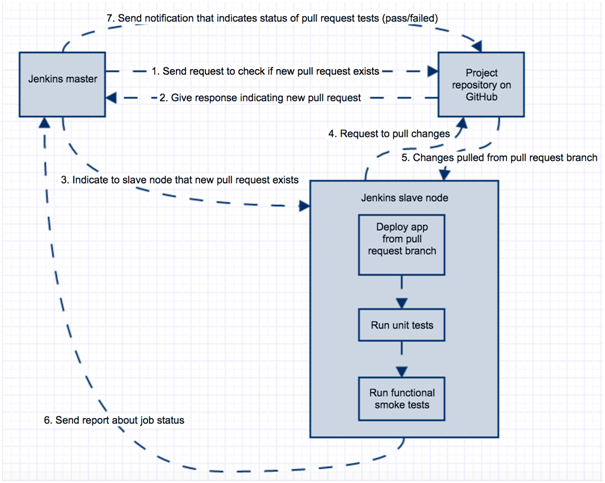 The following article provides a detailed introduction to Continuous Integration (CI), an imperative practice in software development and Jenkins, the industry standard open-source Continuous Integration tool. 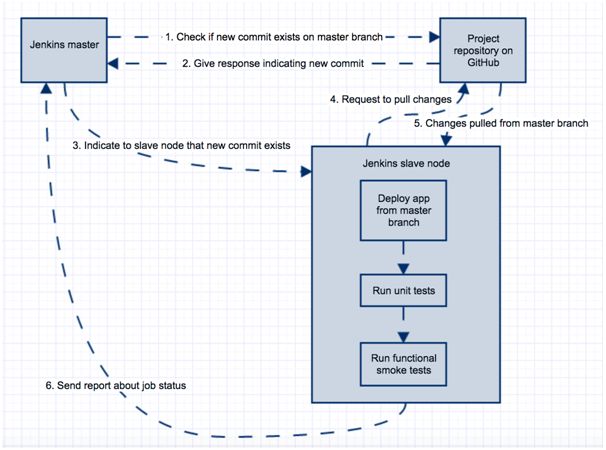 By implementing Continuous Integration and Jenkins CI server, you will discover how Jenkins deployment can assist your development team to release a higher quality software and save precious time. Modern software development practices require deployment of a well functioning software in production as soon or often as possible. For example, agile methodologies directly enforce this behavior by having teams working on small increments and deploying to production after each sprint (read: Test Automation Strategy in Agile Projects). Days when the development team would be developing a piece of software for months, then pass it to QA, UAT and all down the line to production, do not longer exist. These days, the emphasis is on having a well-functioning software and never allowing situations which could endanger software quality, such as when essential software changes are introduced at the end of the release cycle. This is where Continuous Integration comes into use. CI is a practice which enforces frequent integration of tested code to the stable branch of your project. I would especially emphasize “tested code”, since that means that a feature developed on a separate branch is also tested and as such, is integrated to the stable branch. Test automation – a couple of years ago, there was a discussion about manual testing vs. automation testing. With CI, test automation becomes indispensable, this will eventually save a lot of precious time to focus on other testing tasks. It is also worth saying that manual testing and automation testing cannot be mutually exclusive. Test report – for test reports in CI, we can use existing reporting solutions or build our own reporting module. In both cases this gives a clear indication on the “health” of our application’s code with each build run. It is important that this information will be accessible to all members of the development team and constant efforts will be invested in order to upgrade code quality. Deployment process – test engineers are more involved in application’s deployment process, which yields additional information about the internal architecture of test automation tools or frameworks in use. This knowledge is of a great importance especially in order to identify “hidden” application issues. CI emphasizes test automation, allowing the test engineer to keep focus on exploratory testing, testing edge cases or even finding new approaches in testing. Quality of particular commit on specific branch is visible within minutes of developer’s commit. Integration to stable branch is done very carefully after the code has been tested on branch (CI process is supposed to run this). The deployment of an application is executed automatically once properly had been setup, and does not require repetitive commands. From the team’s point of view, all these benefits multiply. Tester: re-test once again feature A on branch A. Developer: peer code review from another developer to make sure that code quality is good enough. Developer: manually merge code to master and resolve any merge conflicts (if arise). Smoke tests save considerable amount of time to both developers who will perform code review, as well as to test engineers who need to re-test feature A on pull request branch. If smoke tests fail on pull request, developers who worked on feature A are now responsible to fix smoke test feature and make new pull request (code with issue will not be merged to master until it is fixed) . This indicates that the merge was successful, smoke test feature still works and it is now the responsibility of test engineers to re-test feature A once again on master branch (to make sure that the merge did not cause any side effect on feature A). Of course, over time it is a good practice to enhance your test automation suite so that most of the features are covered. Job – most important “unit” in Jenkins terminology is the job. 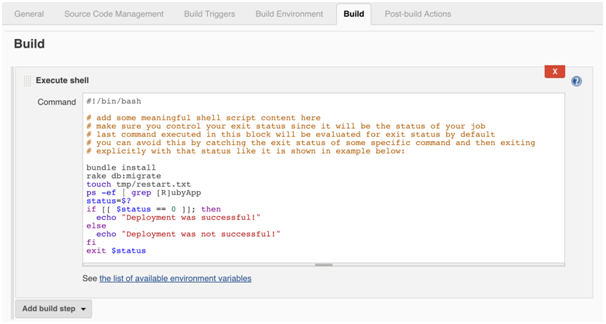 Job is a single execution unit in Jenkins CI server that must have some outcome (pass/fail). For example: a job can be a deployment job, smoke test job, regression test job, etc. Job consists of multiple areas that are executed in sequential fashion, which will be explained in the next paragraph: Anatomy of Jenkins job. 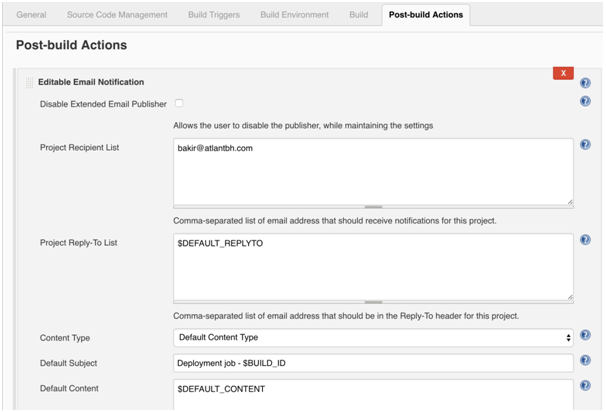 Plugin – one of the major features of Jenkins test automation is the ability to customize it by either using existing plugins or creating your own. Everything in Jenkins tool, from job configuration parts to Jenkins configuration parts is actually plugin. Since Jenkins’ community is substantial, various Jenkins plugins already exist for the use of the most demanding CI workflow tasks. Meaning, it is very likely that you will encounter a helpful plugin instead of creating a custom solution. Node – in the simplest setup, Jenkins instance will be running on one machine and all jobs will be executed there. For minor tests and small number of jobs, it makes sense. However, in practice, there are often cases when multiple teams use same Jenkins instance. Since they have large number of jobs, execution on one instance is considered as bad practice for number of reasons: security, disaster recovery, performance, scalability, etc. 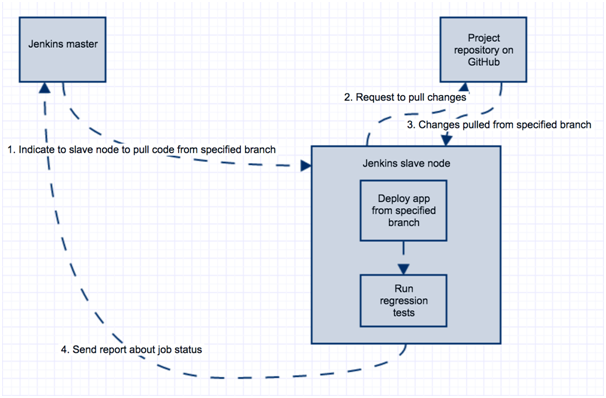 Enter master/slave nodes in Jenkins- Jenkins master is used only for job scheduling that will be executed on Jenkins slave machines. This way, Jenkins master machine is not heavily utilized and teams have their own slave machines with the size most suitable for their test automation project. Also, slave nodes are then configured to handle some number of parallel jobs that are executed (number of executors per each node). There is also a possibility to configure on-demand nodes from AWS. That would mean nodes will exist only when job needs to be executed on them. This is very useful, since we want larger machines that will be fully utilized only when regression tests are running. For this particular scenario, larger EC2 instance would be spinned up on AWS, job will be executed on this instance and when completed (based on idle time configured), this instance would be alive for some time. After that, it would be determined which is more advantageous when using services paid per hour (e.g. AWS services). 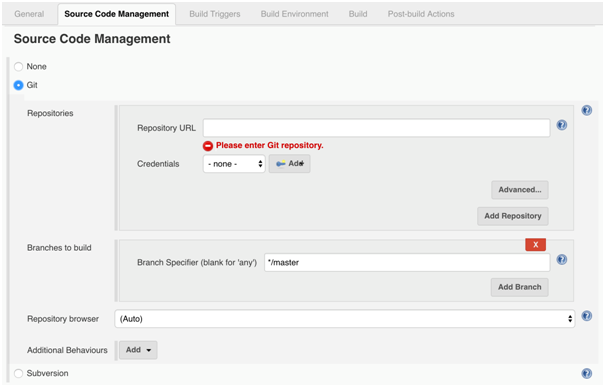 Jenkins Build – in Jenkins CI server, this is the most important step of every job. The result of this step impacts the status of the job at the end of execution. Depending on the installed plugins, many options are available, the most used plugins are: Execute shell, Execute Groovy script, Invoke Ant/Maven/Gradle scripts, execute windows batch command, etc. 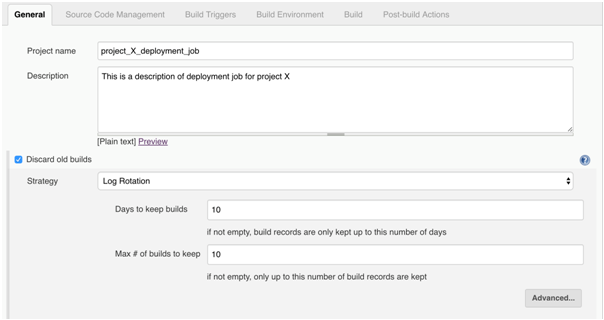 Jenkins Post-build actions – this part of the job is used for reporting results of the job or invoking other jobs in Jenkins pipeline. In general, we can send an email with status of job execution, we can publish HTML reports, JUnit results, publish artifacts that were built in build phase to S3, etc. Notice how $BUILD_ID is specified in email’s subject line. Since this job is parameterized, this value is specified when starting this job. 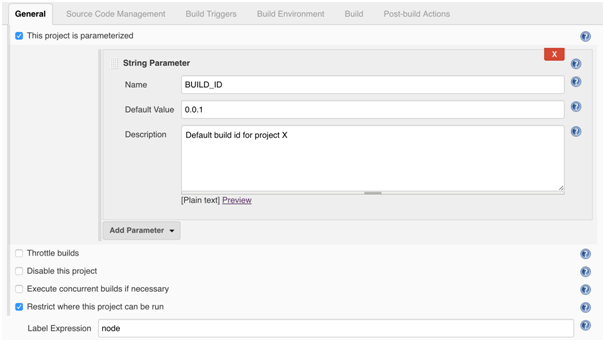 This parameter can be used in both Jenkins Build and Post-build action parts of the job. By now, you are aware of the major advantages of Jenkins CI server and how CI itself adds to the software development process and to a test engineer as well. Same as with every other technology, it takes time to grasp the basics and experience the advantages. I highly recommend investing time into CI, it will definitely be worth it in the long run. Especially, once applying Jenkins CI server, many painful and repetitive procedures will be automated and suddenly you will have more time to focus on product improvements. 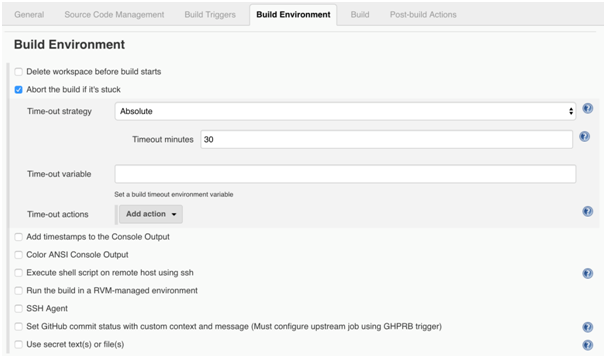 -Does your team implement Continuous Integration and Jenkins CI server as well? Feel free to share your team’s experiences and ask questions in the comments! Fell free to check this.